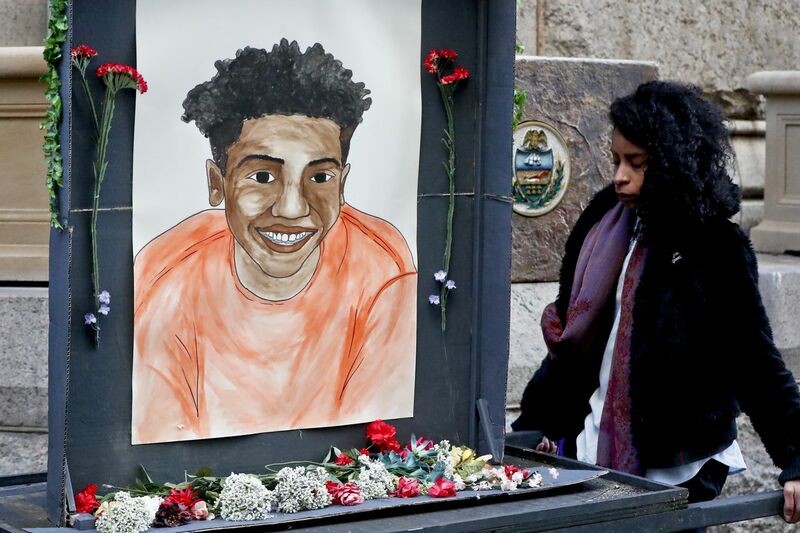 PITTSBURGH (AP) — Jurors on Tuesday saw a video recording of a white police officer gunning down an unarmed black teenager during a high-stakes traffic stop outside Pittsburgh last summer, a key piece of evidence at the ex-cop's homicide trial. Former East Pittsburgh Police Officer Michael Rosfeld, 30, fired three bullets into 17-year-old Antwon Rose II after pulling over an unlicensed taxicab suspected to have been used in a drive-by shooting minutes earlier. Rose was a front-seat passenger in the cab and was shot as he fled. "That type of tone frightened me myself. It was an angry tone. He was mad at something or someone," Lashaun Livingston told jurors. A defense lawyer said Livingston was 60 yards away at the time. Earlier Tuesday, as the trial got underway, a prosecutor urged jurors to focus on Rosfeld's frame of mind when he shot and killed Rose. A jury of six men and six women, including three African Americans, was selected across the state in Harrisburg last week and will be sequestered in a Pittsburgh hotel for the duration of the trial, expected to take a week or more. Debra Jones testified that she was sitting on her porch when she saw Rosfeld shoot Rose just feet away. “Antwon’s family is here seeking the justice they so deserve and to assure that the light of Antwon’s memory shines forever,” said a statement issued Tuesday by the family’s lawyer, Fred Rabner, who represents them in a wrongful-death suit against Rosfeld, the borough, and its mayor and police chief. The family statement called Rosfeld "hair-triggered" and "overly aggressive," adding that his gun had "left an irreparable hole in their collective souls." Rose had been riding in the front seat of an unlicensed taxicab when Hester, in the backseat, rolled down a window and shot at two men on the streets of North Braddock. Hester, 18, of Swissvale, pleaded guilty Friday to aggravated assault and firearms violations for the shooting, which wounded a man in the abdomen. Hester told a judge that he, not Rose, did the shooting. A judge ruled Monday that jurors could hear evidence of that shooting but likely will not hear about a robbery that occurred several hours earlier. Police Sgt. Brian Hodges of North Braddock testified that he and Rosfeld responded to the drive-by, and that Rosfeld went in search of the car spotted leaving the scene. A short time later, Rosfeld pulled it over. While Rose ran from the vehicle, Rosfeld shot him three times — in the right side of his face, in his elbow, and in his back — one of the bullets tearing through his heart and lung. The trial will resume Wednesday.